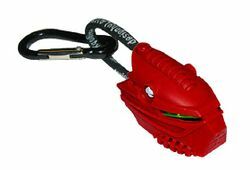 KC839 BIONICLE Toa Hordika Key Chain is a BIONICLE Key Chain released in 2005. It contains a key chain of Toa Hordika Vakama's head. The key chain consists of a carabiner, which attaches into a black loop of cloth printed with white text. The cloth connects into Vakama's dark red Hordika mask. This is the same set as 851098 Toa Hordika Key Chain. Facts about "KC839 BIONICLE Toa Hordika Key Chain"
This page was last edited on 9 January 2016, at 23:44.